Sally stopped and drew a deep breath. Ginger Kemp did not reply for a moment. He seemed greatly impressed. Sally uttered an indignant cry. “Do you mean to say you haven’t been listening to a word I’ve been saying,” she demanded. Today’s post concludes Jon Brierley’s look at The Adventures of Sally –you can catch up from the beginning here. I am incredibly grateful to Jon for taking on this commission for Plumtopia and doing such a sterling job of it. Here’s hoping that bookstores are soon filled with his novels, and we can smugly tell our friends we ‘discovered’ him first. Please do take a peep at his blog (he is also looking for beta-readers if you can spare some of your time for the cause). Nobody ever accused P. G. Wodehouse of being a feminist*, but it strikes me that Sally Nicholas is quite a liberated and modern (for 1921) young woman – no doormat, she. Single, footloose and unchaperoned, she engages freely and on equal terms with all the menfolk she encounters, giving every bit as good as she gets and always (except for when kicked into the slough of despond by the shenanigans of Foster and Fillmore) standing up for herself and on her own two feet, taking no guff from anybody. Wodehouse has been accused of writing in an Edwardian timewarp, but Sally (and the whole book generally) is very clearly a woman of the 1920s, revelling in the newly won post-war freedom for women to work, travel and express themselves independently. Carmyle disapproves of this, but Carmyle is, as Ginger so rightly observes, a blighter. One wonders if, perhaps, Sally owes something to Wodehouse’s wife of sixty-one years, Ethel. Ethel is described as ‘gregarious, decisive and well organised’, which is Sally to the letter. Furthermore, Ethel is said to have taken the ‘shy and impractical’ Plum and arranged his life for him, which again is a thing Sally does (or tries to do) with everyone she meets. If Sally was, at least in part, a portrait of Ethel, one hopes Mrs. Wodehouse took it as the great compliment it undoubtedly was. Sally is an engaging and sympathetic heroine, fun to be with and admirable in every respect. If the book is a little more serious than most Wodehouse novels, and correspondingly less funny than the bulk of his output, perhaps, just perhaps, it was because the protagonist was a little closer to Wodehouse than usual – and as we have seen, the story incorporated a number of elements from Wodehouse’s real life. Plum himself, of course, was very far from being a chump, so there isn’t much of him in Ginger, I don’t think, but nevertheless the personal connections between the story and the author, while speculative, are, I feel, attractive. Seen in this light, what seems a fairly insubstantial work at first glance becomes more interesting, and perhaps worthy of a higher rank in the Wodehouse canon. Of course, I could be wrong. But I’d like to think I’m not. 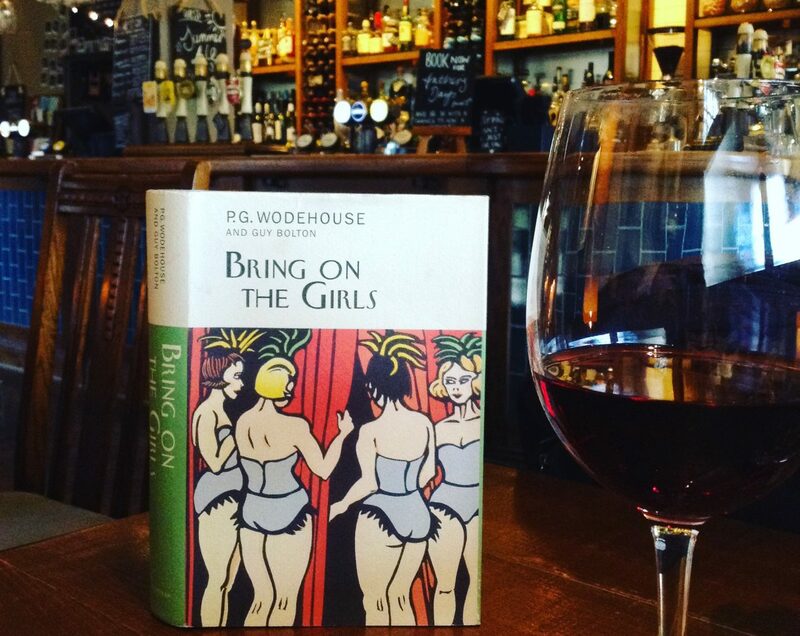 Readers may be surprised to learn Wodehouse has been accused of being a feminist. ‘P.G. Wodehouse, Feminist’ was the title of Elin Woodger Murphy’s memorably convincing talk at the 2015 Seattle convention of The Wodehouse Society (US). Elin in turn, took her title from an excellent 2005 article by Marilee Scott. And I have argued in support of Wodehouse’s feminist credentials myself (try Wodehouse’s women: in the eye of the beholder). Well, only by three of us that I’m aware of. Hardly a throng! And the idea hasn’t really gripped the public at large. for her transforms him from a wastrel to a dog-biscuit-selling dynamo. Ashe Marson to get out of his rut writing cheap detective fiction. him, and helps him set up as a successful dog breeder and trainer. boyfriends to get some pep into their lives. Wodehouse always approves of these independent young women; when you consider that these stories were written beginning about 1915, the perspective is amazingly feminist. and there are many others showing that Wodehouse was sympathetic to and highly approving of strong, capable, and hard-working women (unless they happened to be meddling cranks such as food reformers, eugenicists, and theosophists). If a reader of Wodehouse begins and ends with the popular Jeeves-and-Wooster and Blandings Castle sagas, it is possible to draw the wrong conclusions about Wodehouse’s attitude toward women, since the dramatic conflicts in each are based on a central character (Bertie and Lord Emsworth respectively) who wants nothing more than to be left to live his life as he likes. Bertie’s aunts and temporary fianceés, like Clarence’s sisters and nieces, then, need to become in some senses “comic villains” (using the terminology of that 2000 discussion cited above), posing a threat to the hero’s peace of mind and quiet life, to provide the dramatic conflict required for a good story. But as soon as one approaches the non-saga stories, especially the 1910s romantic fiction, all sorts of instances abound of true heroines who are portrayed as brainier, better-organized, pluckier, and more practical than the men around them. Bravo Neil! Thank you so much for taking the time to share this. I agree with you entirely. In particular, I agree that mistaken ideas about Wodehouse tend to arise when critics are only familiar with the Jeeves stories. One critic, I recall, got herself all het up after reading a single story — and made all sorts of claims as a result. I for one has always held that the delicately nurtured hold all the aces in the Wodehouse canon. They are anything but comic villains. They inspire. They assert. They prod the so-call sterner ones they like in the ribs and egg them on to greater things in life. Yes, there are also those in the Madeline mould, but those are few. Even when they are goofy, like Stiffy or Bobby Wickham, they prove themselves to be possessing grey matter which is of a superior quality. Perhaps, Mrs W is the inspiration behind many of these brainy and well organized kind. We, the readers, are not complaining.